bars by area, dragging a polygon edge no longer takes its boundary out of the plane. When using Excel design with connections, if the .xls file is not found, the error message is no longer hidden behind other windows on the screen. (56), you can now separately control the bolt types of Brace bolts 1 and 2 on the gusset side and the bracing side. In Tube crossing (22), the spacing between two connection plates now works correctly. (20), the end plates are now created correctly. and the bolts were placed incorrectly. This has now been fixed. In Column with stiffeners S (187), the bolt edge distance is now correctly applied with sloped beams. In DWG/DXF export, when adding, editing or deleting multiple rules, the buttons are now always visible. Previously they would not be visible with multiple rules if the list of rules was scrolled down. In DWG export, there is now a new check to see if files can be written to before the export starts. You are also prompted to close the files. If an exported file already exists, a dialog box is displayed asking if you want to overwrite the existing files. change detection, the reference model rotation changes are now detected better. Tekla Structures no longer crashes with horizontal column output in templates. : The Extend command is working again. Rows are no longer overlapping when you use Right alignment. Opening of some drawings could sometimes fail. This has now been fixed. extremes are no longer exported. When you create several drawings at a time, Tekla Structures shows a progress dialog with a Cancel button. However, clicking the Cancel button did not stop creating new drawings, but created them without templates. This has now been fixed. Moreover, now the dialog box also shows two progress bars: the first bar shows what is done for each drawing, and it goes back and forth. The second bar proceeds steadily after every drawing. Previously snap settings in drawings were saved only if you saved the drawing through the File menu. The settings were not saved if you saved the drawing by closing the drawing and selecting the Save option. Now snap settings are saved properly in both cases. dimensioning: The attribute CC_TARGET called on a single rebar in a rebar set group provided the zero value. This has now been fixed. dimensioning: The tool now adds a correct number of dimension lines, and the lines are aligned correctly. When you open a drawing that contains pattern lines, and the .clp file of a pattern linedrawing shape that consists of one or several blocks of elements and that may include symbols, lines, and spacings. Pattern lines can be used to indicate cut lines, foundations, weld paths, or electrical wiring, for example. is missing, a report window will be displayed. 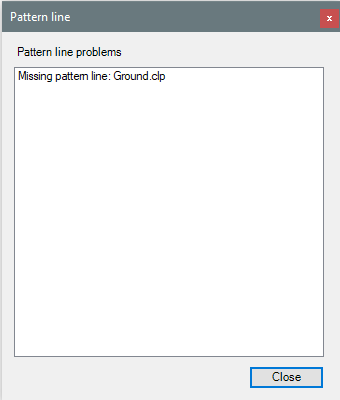 The report will contain a list with the name of each pattern line that does not have a related .clp file. could open very slowly. This has now been fixed. and it may function incorrectly when a shared model is opened with a system locale that is incompatible with the one that was used when starting to share the model. file handling could copy temporary files to another model, which could make history reading and writing to report database corruption. Now this has been fixed. Such files are never written out and not read during read in. Saving of shared models is now more robust than before in situations where antivirus and similar software put temporary locks on model files. Failed operations are retried and written in error logs. Filtering reinforcing bars by using 'length' now works correctly again. Previously, saving the model with Save as failed in some situations and Tekla Structures displayed the message Model memory is corrupted. This has now been fixed. The saving of multi-user models has been improved to work more reliably. Filtering based on OWNER or HISTORY.OWNER now works with both <DOMAIN>/<username> and <DOMAIN>\<username>. The silhouette edges are drawn correctly again for high accuracy hollow profiles when XS_DISPLAY_FILLET_EDGES is set to FALSE. In model view the size of the objects is the same despite of their distance to the viewing point and the zoom remains on part faces. snapping, the snap points are now shown with perpendicular snap symbols. For example, an analysis part automatically snaps or connects with rigid links to other parts based on the analysis part connectivity. In different analysis models, a physical part is represented by different analysis parts. When you tried to change the advanced option XS_​DRAWING_​PLOT_​FILE_​NAME_​W in Russian language, Tekla Structures crashed. This has now been fixed. Previously, closing Tekla Structures after model loading failed could cause Tekla Structures to crash. This has now been fixed. In Radial array tool, angle values with decimals are now supported in regional settings. in the actual project model, instead of a random number. , prefix, and start number. Previously, saving the model with Save as could cause Tekla Structures to crash and restart instead of exiting. This has now been fixed. BVBS Export: Circular and spiral rebars had incorrect spacing values. This has now been fixed. Export Unitechnik (79): You can now use all combinations of texts, templates and counter symbols with the option Text[Template]#Counter. wire using the terminal hook flection form will now have their geometrical data series systematically rounded in borderline cases. Export Unitechnik (79): The width of embeds created as B-rep items is now exported correctly. Export Unitechnik (79): You can now specify if uncollected reinforcement is excluded using the new option Collected for the setting Rebars export on the Reinforcement tab. width value between sandwich panel shells.